Simon & Schuster, 9781451697384, 576pp. 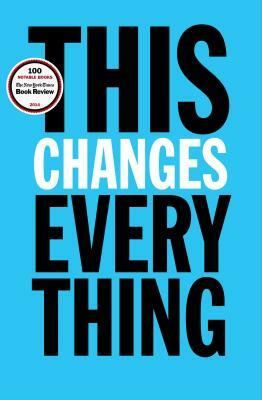 "This is the best book about climate change in a very long time—in large part because it's about much more. It sets the most important crisis in human history in the context of our other ongoing traumas, reminding us just how much the powers-that-be depend on the power of coal, gas and oil. And that in turn should give us hope, because it means the fight for a just world is the same as the fight for a livable one." "Naomi Klein applies her fine, fierce, and meticulous mind to the greatest, most urgent questions of our times. . . . I count her among the most inspirational political thinkers in the world today." — Robert F. Kennedy, Jr.
"Klein is a brave and passionate writer who always deserves to be heard, and this is a powerful and urgent book." "[Klein's] journalism won't slow down the fossil fuel companies, but it surely holds out hope for activists looking to avert a disaster. . . . A sharp analysis that is bound to be widely discussed." "The book has an uplifting message: that humans have changed before, and can change again. It poses a gutsy challenge to those who are vaguely hoping that the whole issue will go away, or that some new technology will save us."